Universally known as JCB, J.C. Bamford Excavators Limited is a success story built on hard work and innovation. Joseph Cyril Bamford rented a lock-up garage and purchased a second-hand welding set for £1 from English Electric in October 1945 and set to work building a tipping trailer from war-surplus air raid shelters. Bamford sold it £45 and immediately started on the next one. His motto was “Jamais content” and to this day JCB are “Never happy” to sit back on a design but constantly strive to improve the many products that have led to JCB into being a world's third-largest manufacturer of construction equipment, backhoe diggers, excavators, tractors and diesel engines. 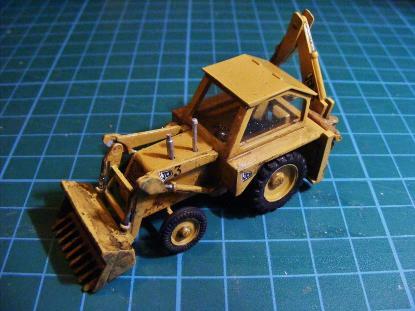 In fact in many parts of the world backhoe diggers are called JCBs whatever the name of their actual manufacturer. Colloquially known as a Backhoe the “ Tractor, loader, backhoe digger”, was arguably the design which cemented JCBs position in the construction market and provided the stability and security that has allowed the firm to thrive. The idea has it's origins in the US company the Wain-Roy Corporation who tested the first actual backhoes way back in 1947. These vehicles are relatively small so they are ideal for fixing urban roads and building houses so they are a very common sight on urban engineering and construction sites. The "TLB" is equally at home in farming and is a regular feature on agricultural establishments where it's flexibility for loading and digging is of great value, particularly for space saving and value for money. In 1961 the new JCB 3 series set new standards for the market and over the years was constantly updated to include revolutionary ideas and systems. 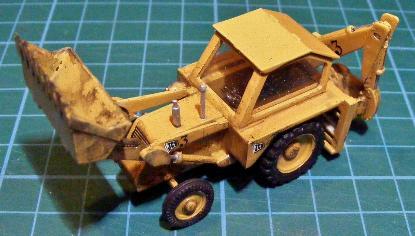 The JCB 3 was a smaller version of the JCB 4. With development design work having started in 1960 the model made it's first appearance in summer 1961 at the Crystal Palace Plant show. It featured the pioneering JCB Hydraslide system that allowed the operator to position the backhoe anywhere across the chassis so as to get up to walls and allow him a clear view along the trench he was excavating. Changes to the appearance, like squaring off the mudguards, were continuous alongside major changes to the power units in order to make the model more powerful. By the time the 3C a new cab with side doors was in place and the production lines in full swing. From national institutions to private hire firms the JCB 3 was a must have vehicle that proved it's worth time and time again. In 1969 JCB were awarded their first Queen's Award for Export Achievement as they were exporting more than half their produce. Today JCB has 22 plants on four continents and a workforce in the region of 11,000 people, all still proudly adhering the the idea of never being satisfied with a design and always striving to give the best standards of production and service. The 1:76th scale Airfix B.R. 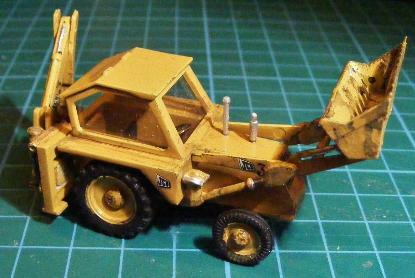 Lowmac 14 Ton chassis with J.C.B. 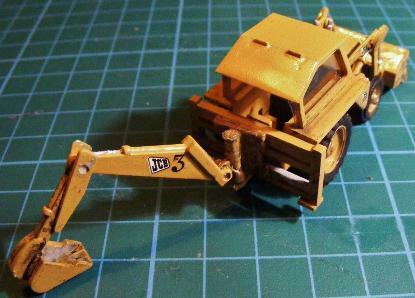 3 Excavator load (Airfix kit #R204) was first released in 1966. That kit had a few re-releases but the “load” became a separate item only when Dapol released it in 1985 under the Dapol-Kitmaster name. 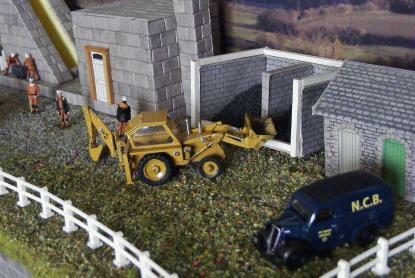 Rosebud Kitmaster were the original producers of many of the railway loco's and kits Airfix took over. 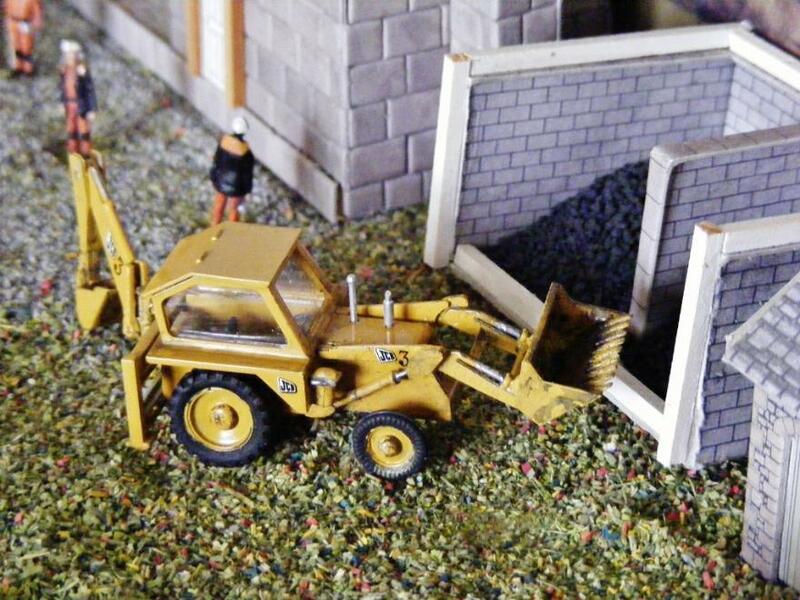 Although the digger was never an actual kitmaster product the rolling stock chassis probably was and as such Dapol might have thought it proper to use the “Kitmaster” name out of respect as well as for the boost a recognisable railway producers name might give to sales. 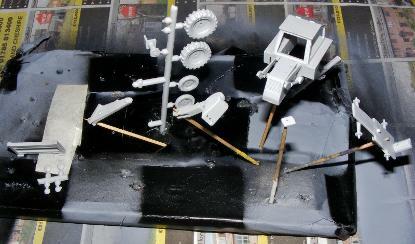 Dapol also, like Airfix before them, used the lowmac chassis to release many railway tankers and loaders. Having taken over many of the Airfix moulds Dapol have become a major supplier of railway stock and scenic items. 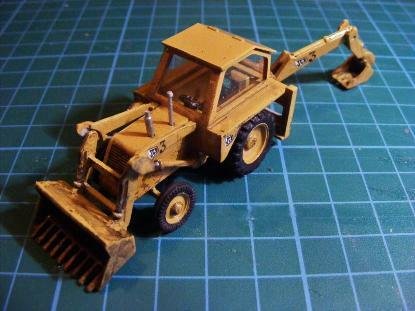 The digger is now available as Dapol kit #C045. Rod built this model in 2012. 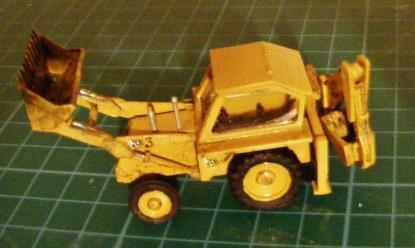 It is straight from the box (well, bag), and painted with Halfords spray paints and Humbrol enamels. It now resides on the railway display of a neighbour of long standing.